LOS ANGELES (April 17, 2018) — Investigators at Cedars-Sinai are exploring a new way to treat amyotrophic lateral sclerosis (ALS) by transplanting specially engineered neural cells into the brain. Their new study shows the transplanted cells delayed disease progression and extended survival in animal models. 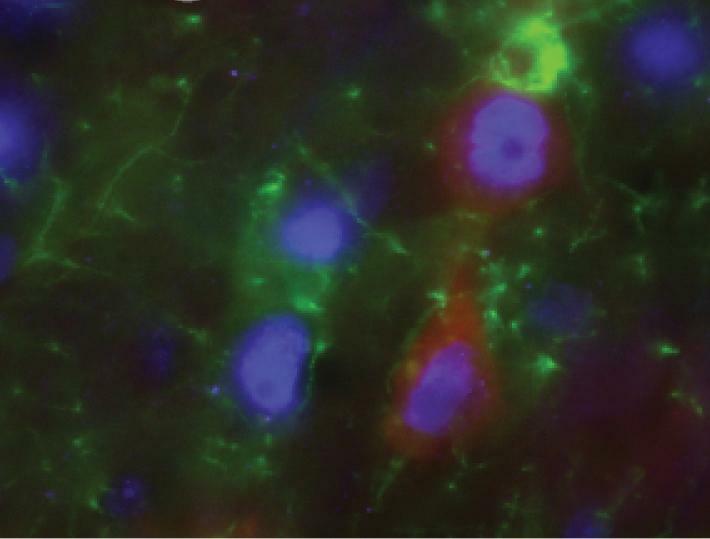 Once inside the cortex, the transplanted cells in the study matured into glial cells and released GDNF into the brain–a major scientific achievement in itself. Laboratory rats that received the transplants lived 8 percent longer and were free of paralysis 10 percent longer than were untreated animals. Motor neurons in the spine, which control muscle movement, also survived longer in the experimental group. Besides Thomsen, the study team included senior author Clive Svendsen, PhD, professor of Biomedical Sciences and Medicine and director of the Cedars-Sinai Board of Governors Regenerative Medicine Institute–and co-authors from the Institute, the Biobehavioral Research Core and the Department of Biomedical Sciences at Cedars-Sinai, as well as from the University of California, San Francisco.